Paid as well as free music services! Initially, the music streaming services in India wooed users by allowing them to listen to songs for free. Ad-fueled revenue models helped them survive piracy-driven market till the time people got used to the concept of online music streaming. Later, they introduced premium plans for users who are comfortable in paying money to remove advertisements and unlock additional features such as offline mode. 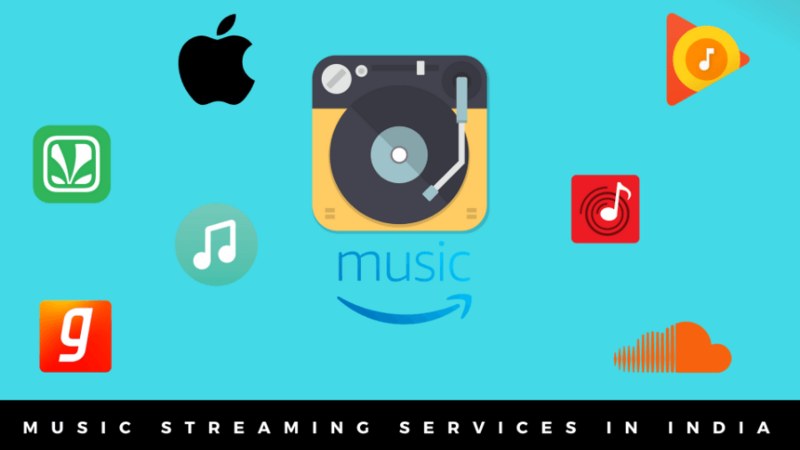 The online music party started with Gaana and Saavn was later joined by Apple Music, Google Play Music, and the most recent entrant Amazon Music. Why should you use dedicated music streaming service? People using YouTube to listen to songs is still a common sight in India. The prime reason is the ease of access which complements YouTube’s freely available gigantic video library. It is no doubt that YouTube is beyond competition but there are some reasons why you should go for a full-fledged song streaming service instead. For instance, there are free music streaming apps in India. Unlike video streaming services that require fat data plans, music streaming apps can work even on 2G networks. So, using a music app would be a wiser move. Obviously, you can use the offline mode on YouTube, but it lacks the library management features offered by music apps. Many song streaming apps offer a great user experience and cater massive song libraries to their subscribers. So, here are the best music streaming apps in India that people can enjoy during their solitude or at times when they turn into a party animal. In your spare time, don’t forget to read about the best music player apps for Windows 10, Android, and Linux. Note: This list isn’t arranged in any order of preference. 1. Apple Music – for the Apple fan in you. Platforms supported: Android, iOS, Web, MacOS, etc. Ideal for: streaming International music, Apple devices. Apple Music is built on top of Apple’s existing digital infrastructure that reinvented the ways people consume music: iTunes and iPod. It may not be the cheapest music streaming app available in India, but it offers a lot for the price users pay. 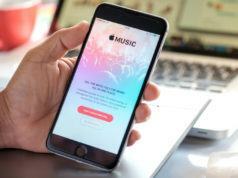 People with an Apple ID can stream unlimited songs on iOS, Android, macOS, and Windows devices. Five people (with around three devices each) can use the service at the same time. If you have used various music streaming apps, one thing you’d immediately notice about Apple Music is its neat and clean interface. In fact, its Android app is the most sorted of all the music streaming services I have tried, except SoundCloud. The inclusion of a dark theme or night mode would have been an advantage. On the other hand, the experience on Windows is equally frustrating. Thanks to the sluggish iTunes and updates pushed less frequently by Apple. 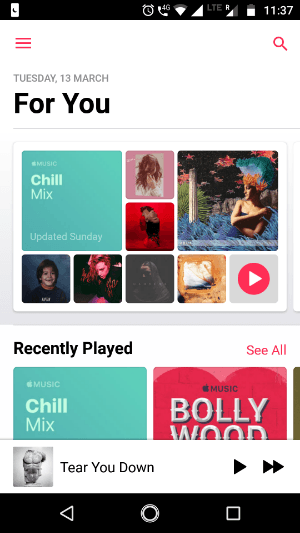 There aren’t any issues regarding the music library with over 45 million songs offered by the Apple Music for its Indian audience. Apple already expanded it to include tons of songs and albums in Hindi and other Indian languages. The app tries to cater a personalized music experience to the users by asking them their favorite artist and genre. Users can either hook up an individual song, playlist, or tune in to some genre-based internet radio station, or Apple’s in-house 24-hour radio called Beats1. Apart from songs, Apple Music streams a limited collection of music videos and stage shows. 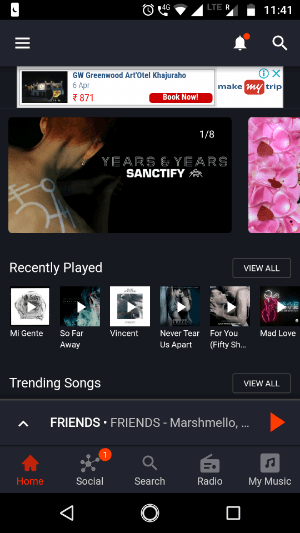 It also features a sort of a mini social network called ‘Connect’ that allows users get updates from musicians and singers. 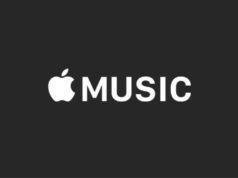 Overall, Apple Music provides excellent sound quality that is complemented by its abundance of music. However, users might face issues with their credit card loving payment system. Apple doesn’t support all the Indian debit cards. Platforms supported: Android, iOS, Web, Amazon Alexa, Fire TV, etc. Amazon Prime Music was there on the Indian soil with limited access to the owners of the Alexa-powered Echo devices. Just recently, the popular music streaming service has received a full-fledged launch on the Web, Android, and iOS platforms. 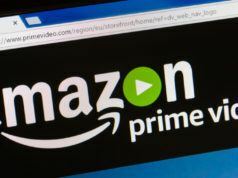 Being fueled by Amazon for years, the service is a part of the company’s existing Prime subscription that provides deals, faster delivery, and access to Prime Video streaming service. When it comes to the size of the music library, Amazon Prime Music is no less than its competitors with access to over 30 million songs. 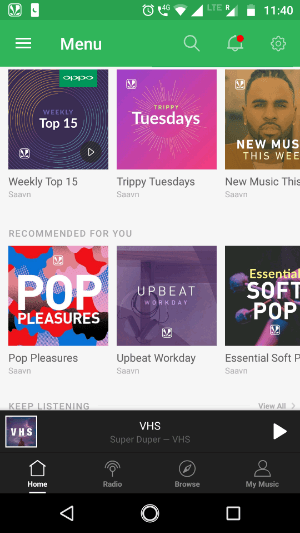 Prime Music’s Android and iOS are visually appealing with out-of-the-box Alexa integration to allow voice-controlled music playback. And unlike its video streaming sibling, the app offers Chromecast support. 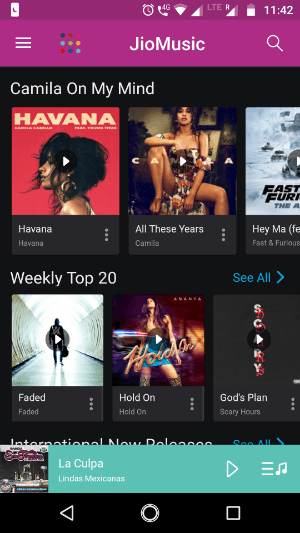 While the Android and iOS deliver user experience almost as expected, what’s surprising is its fluid web app that makes music streaming in web browsers an entirely new experience. Platforms Supported: Android, iOS, Web, UWP, Xbox, etc. You might have heard about SoundCloud a lot. The Germany-based music streaming service is known for its massive library of songs created by independent artists. So, SoundCloud which is visited by around 175 million users every month poses itself as one of the best free music streaming services. For almost ten years, it has been a reliable platform where growing artists can upload up to 6 hours of their content without any cost. Artists can get recognition as the service provides a way for users to follow their favorite artists’ profile and receive updates about them. Apart from songs and albums, the SoundCloud also has an extensive collection of audiobook and podcasts ranging across different genres. Despite being a free music streaming service, SoundCloud’s simple to use website doesn’t annoy you by bombarding tons of advertisements in the middle of your songs. In fact, its mobile, and web apps provide possibly the best aesthetic pleasure among all the names in this list. You can find music in two sections: Charts, where songs list under ‘Top 50’ and ‘New & Hot.’ Here you can also choose your favorite genre to narrow down your search. 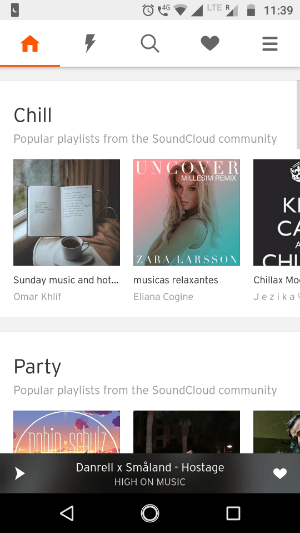 Another section is Discover, where you can find song lists curated for partying, chilling, relaxing, etc. One way SoundCloud is different from other music services is it doesn’t have licensed music you usually find on Apple Music, Prime Music, etc. However, you may discover covers of some favorite songs. SoundCloud isn’t a barren land when it comes to licensed music. It offers paid subscription called SoundCloud Go+ that allows users to stream licensed music and download songs for listening while they’re offline. Sadly, the feature is yet to arrive in India. Platforms Supported: Android, iOS, Web, UWP, etc. You might have thought of Saavn as an India-based music streaming service, but it was developed in the US. The name is because the creators were of Indian origin. 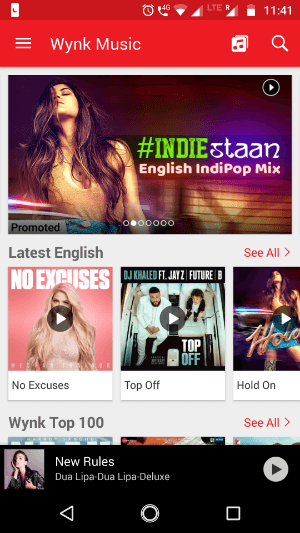 It has always been in tight competition with another Indian song streaming app Gaana. 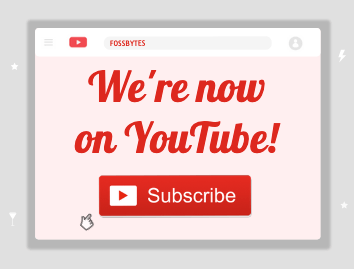 The service mostly relies on ad-supported freemium revenue model but also offers a premium subscription for the users who can pay some money. It doesn’t ask free users to create an account. Saavn made early attempts to include international content into their growing music catalog which appears to be enough for users. But it degrades user experience with its bloated mobile apps and website. Its Windows 10 UWP app seems to be the best among the lot, but the app also crashed a couple of time during the usage. Still, Saavn appears to be loaded with optimism. If you don’t believe me, check the Settings > Stream Quality screen. The music streaming service offers Facebook integration to let you know what songs and artists your friends are following. One thing that I like about Saavn is its language filter. While other music services only take language preference to optimize music discovery and throw song suggestions, Saavn shows songs just in the language you have selected. Ideal for: streaming Bollywood music. Gaana was the first music streaming service I ever encountered when there weren’t many song streaming sites available in India. Soon, I had to ditch the messy interface of Gaana for other clean services like Apple Music, and mostly recently SoundCloud. But this doesn’t mean that Gaana is less capable as a music streaming service. Its vast collection of songs and albums in various Indian languages can keep you glued to the service for hours. Gaana features international music as well, but the library isn’t as extensive its foreign competitors. Similar to Saavn, you can connect your Facebook account to Gaana and follow your friends. The service takes friend spying to another level. You can literally see the names of the songs your friends are listening. And believe me, not everyone wants to reveal what their music taste. However, Gaana includes options to turn off the profile activity whenever you want. The service offers many features that might be quite helpful for the users including night mode, sleep timer, gapless playback, etc. However, the features differ by platform, with more emphasis given to Android and iOS. Platforms supported: Android, iOS, Web, Google Home, etc. The search giant Google is also trying to be a part of the Indian music streaming space. It might have licked the success cookie overseas, but Google Play Music Unlimited is making efforts to lure than Indian audiophiles with its competitive pricing. Having a Google label gives it a big upper hand as the Play Music app comes preinstalled on almost every Android phone. It increases the possibility of the users bumping into the app someday. It should not be confused with the Google Play’s Music section where songs and albums are available for a one-time purchase. Now, talking about what the service offers. It comes in both free and premium options where the free version only lets users listen to Indian language featured songs and radio stations. A paywall protects its regular music catalog including albums and international content. When it comes to apps and services designed by Google, the user experience is taken for granted. Same is the case of Play Music. However, the app differs from other music streaming apps. The content is served differently, with radio stations more visible to the users. It is more convenient as there won’t be many who would listen to the entire collection of a single artist. Full albums can be accessed by searching the name of an artist. Free: Streaming limited to radio stations. 14 days free trial of the paid version. Paid: INR 99 per month. Platforms supported: Android, iOS, Web, etc. Another India-based name to rank among the best music streaming services is Wynk. Being owned by the telecom company Bharti Airtel has its benefits: Airtel users take user the Wynk without paying any cost. Primarily, Wynk has its focus on Android and iOS, a poorly designed website also exists. Anyway, the apps provide a great listening experience with a well-designed UI and also pack some pretty neat features. Its music library ranges from songs in Hindi, and other regional languages, to International popular music that mostly rules current Indian clubs and parties. Wynk Direct is a feature that allows people to share songs with other Wynk users over WiFi. 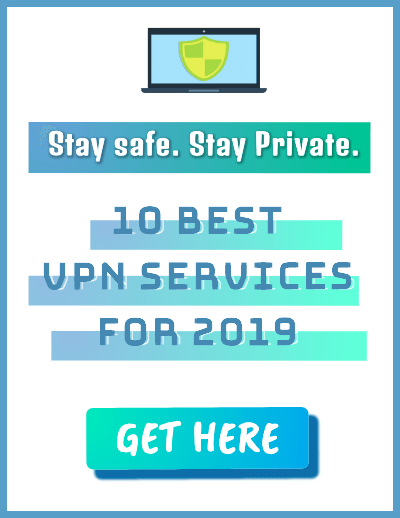 It works similar to YouTube Go and eliminates the need for an active internet connection. The app also gives focus to workout by adding a special section, where playlists are curated for 6 Km and 21 Km marathons. You can filter these playlists in Hindi and English languages, and further by genre. Overall, Wynk provides a great music experience without the users being asked to create a new account. One thing that would annoy users during initial use is that the app configured to add songs to the ongoing playlist when you tap on a title. You can change it in the settings. Also, even if you play songs locally stored on your device through Wynk, the app automatically adds online songs in between. Free: Stream songs without the offline mode (regular users). Free trial available. Airtel Users: Bundled with the mobile plan. Platforms supported: Android, iOS, etc. Similar to JioCineama, this is a free music app bundled with the Jio mobile plan. The music app is yet another attempt to keep users within the closed garden of the Indian mobile operator. It can be called one of the best music streaming apps in India, but its limited access is a potential downside. 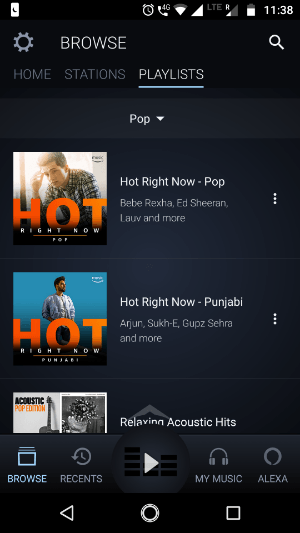 JioMusic also displays tons of songs and playlists just like other Indian music streaming apps, but it doesn’t seem to mess things up and annoy users. UX design efforts have been made, and there seems to be no reason to hate the app. However, a big drawback is the absence of a web app that can allow users to use JioMusic via their browser. Other music services take the lead here. Although the service also works over WiFi and doesn’t mandate Jio sim to be present on your device, there are a couple of features designed specifically for Jio users. The ‘Set as JioTune’ allows users to set a particular song as their caller tune. JioMusic also lets users listen to latest international music in addition to songs and albums in Hindi and other Indian languages. While listening to their weekly top 20 playlist, I don’t usually feel the urge to skip songs. The app also comes with a dark theme that seems to improve its look and feel even further. Overall, there is still scope for some visual improvements in the player’s interface. 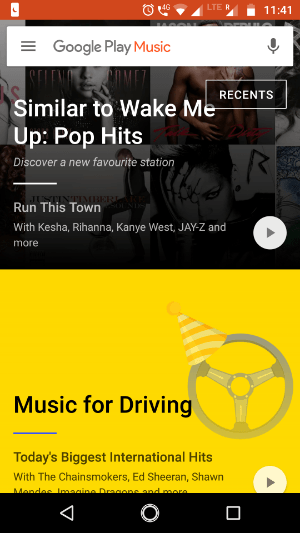 The best music streaming app in India – what should you choose? So, what do you think? What’s the best music app you should consider? Just like the case of video streaming services, choosing a music service pretty much depends on a user’s needs. While Apple Music seems to be the costliest affair of all the options, it’s actually a lot cheaper when used by multiple users on family plan. It supports close to 15 devices. Amazon’s Prime Music steals the show among the best music streaming apps as well. With its vast library of high-quality music offered at less than INR 100 per month, it is the deal Indian users have always wanted. It can be easily assumed that reduced costs are a part of Amazon’s strategy to spread their presence across the nation. Google Play Music with support for up to 10 devices is also an option worth considering. You can use it if you are only limited to radio channels playing Indian music. SoundCloud needs special mention as the music streaming service only features indie songs. Stream it anytime you want as it’s completely free. Now, talking about India-based music services, you can use them anytime as the audio streaming is free. Both Saavn and Gaana offer the music library of roughly the same size with around 30 million songs. Also, they provide regional language options than other competitors. On a personal note, I have preferred Saavn over Gaana due to its user experience. Airtel users might want to favor Wynk music. But if what’s written on their site is accurate, its music library only has 2.2 million songs, though it covers all the latest ones. You really don’t need a paid music streaming app if you listen to songs once in a while. Regarding JioMusic, practically you can use the service if you have a Jio mobile number. So, it can only be recommended to Jio users as its available for free and provides a decent experience with its music library of over 14 million songs. So, these were some of the best music streaming services you can consider if you’re an audiophile living in India. I’ll try to add more names to the list. Feel free to make any suggestion in the comments.